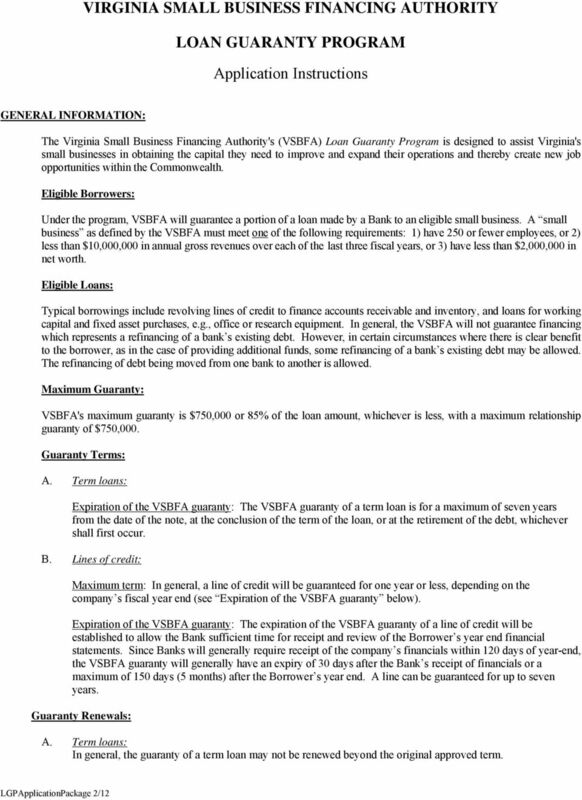 Download "VIRGINIA SMALL BUSINESS FINANCING AUTHORITY LOAN GUARANTY PROGRAM. 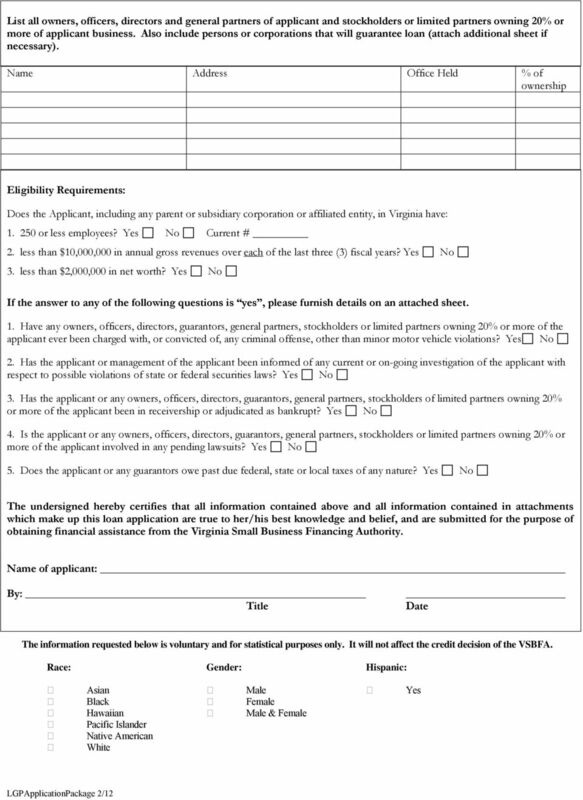 Application Instructions"
1 VIRGINIA SMALL BUSINESS FINANCING AUTHORITY LOAN GUARANTY PROGRAM Application Instructions GENERAL INFORMATION: The Virginia Small Business Financing Authority's (VSBFA) Loan Guaranty Program is designed to assist Virginia's small businesses in obtaining the capital they need to improve and expand their operations and thereby create new job opportunities within the Commonwealth. Eligible Borrowers: Under the program, VSBFA will guarantee a portion of a loan made by a Bank to an eligible small business. A small business as defined by the VSBFA must meet one of the following requirements: 1) have 250 or fewer employees, or 2) less than $10,000,000 in annual gross revenues over each of the last three fiscal years, or 3) have less than $2,000,000 in net worth. Eligible Loans: Typical borrowings include revolving lines of credit to finance accounts receivable and inventory, and loans for working capital and fixed asset purchases, e.g., office or research equipment. In general, the VSBFA will not guarantee financing which represents a refinancing of a bank s existing debt. However, in certain circumstances where there is clear benefit to the borrower, as in the case of providing additional funds, some refinancing of a bank s existing debt may be allowed. The refinancing of debt being moved from one bank to another is allowed. Maximum Guaranty: VSBFA's maximum guaranty is $750,000 or 85% of the loan amount, whichever is less, with a maximum relationship guaranty of $750,000. Guaranty Terms: A. Term loans: Expiration of the VSBFA guaranty: The VSBFA guaranty of a term loan is for a maximum of seven years from the date of the note, at the conclusion of the term of the loan, or at the retirement of the debt, whichever shall first occur. B. Lines of credit: Maximum term: In general, a line of credit will be guaranteed for one year or less, depending on the company s fiscal year end (see Expiration of the VSBFA guaranty below). Expiration of the VSBFA guaranty: The expiration of the VSBFA guaranty of a line of credit will be established to allow the Bank sufficient time for receipt and review of the Borrower s year end financial statements. Since Banks will generally require receipt of the company s financials within 120 days of year-end, the VSBFA guaranty will generally have an expiry of 30 days after the Bank s receipt of financials or a maximum of 150 days (5 months) after the Borrower s year end. A line can be guaranteed for up to seven years. Guaranty Renewals: A. Term loans: In general, the guaranty of a term loan may not be renewed beyond the original approved term. 2 B. Lines of credit: Annual renewals of the VSBFA guaranty: VSBFA anticipates that Borrowers in the Loan Guaranty Program will be able to strengthen their financial or operating condition within a seven-year period and thereby graduate out of the program and qualify for conventional financing. However, there may be occasions when a Borrower is still unable to meet the Bank s conventional underwriting criteria within the seven-year time frame. The Borrower s inability to meet these underwriting guidelines could result from, for example, an economic downturn within the industry, region or general economy or a significant event that compromises the company s financial integrity, such as the loss of a major customer. In these cases, a participating Bank may request the renewal of VSBFA s guaranty for a line of credit beyond the stated seven-year maximum. In addition to the usual application information, VSBFA will require the following to accompany requests for renewals beyond a seven year period: Bank s assessment of why the Borrower has not been able to graduate from the Loan Guaranty Program. Bank should cite events that contributed to the Borrower s inability to improve its financial condition. Bank s defined and measurable plan of action for either: i) helping the Borrower attain greater financial strength; or ii) exiting the relationship. 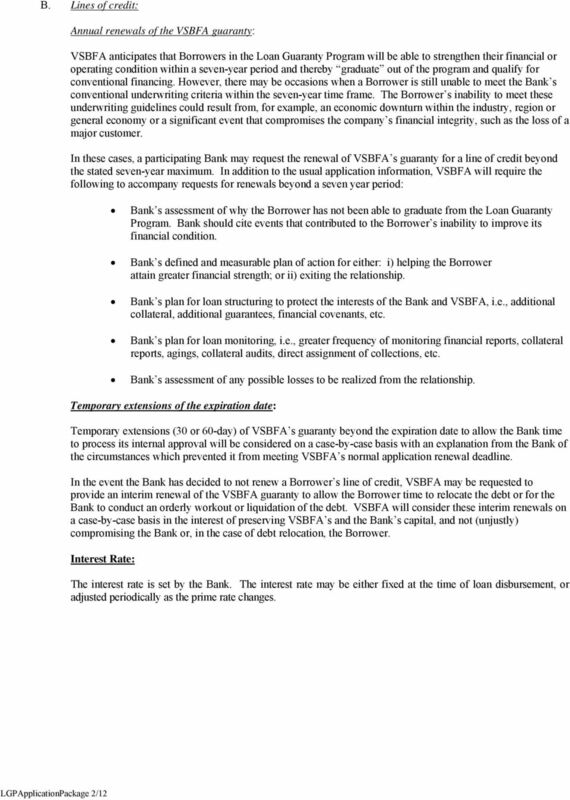 Bank s plan for loan structuring to protect the interests of the Bank and VSBFA, i.e., additional collateral, additional guarantees, financial covenants, etc. Bank s plan for loan monitoring, i.e., greater frequency of monitoring financial reports, collateral reports, agings, collateral audits, direct assignment of collections, etc. Bank s assessment of any possible losses to be realized from the relationship. Temporary extensions of the expiration date: Temporary extensions (30 or 60-day) of VSBFA s guaranty beyond the expiration date to allow the Bank time to process its internal approval will be considered on a case-by-case basis with an explanation from the Bank of the circumstances which prevented it from meeting VSBFA s normal application renewal deadline. In the event the Bank has decided to not renew a Borrower s line of credit, VSBFA may be requested to provide an interim renewal of the VSBFA guaranty to allow the Borrower time to relocate the debt or for the Bank to conduct an orderly workout or liquidation of the debt. VSBFA will consider these interim renewals on a case-by-case basis in the interest of preserving VSBFA s and the Bank s capital, and not (unjustly) compromising the Bank or, in the case of debt relocation, the Borrower. Interest Rate: The interest rate is set by the Bank. The interest rate may be either fixed at the time of loan disbursement, or adjusted periodically as the prime rate changes. 3 INSTRUCTIONS: 1. The Borrower must submit to a Bank a completed Borrower s Loan Application and all required financial information. This should provide the Bank with enough information to consider the loan request. 2. 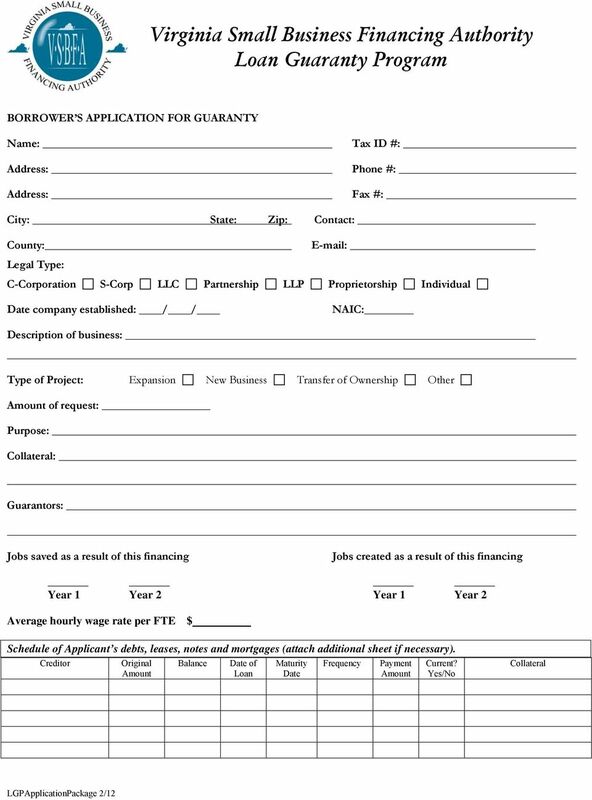 If the Bank determines that VSBFA's guaranty is necessary in order to provide the financing requested, the Bank must complete the enclosed Bank s Application for Guaranty. Banks are encouraged to contact a VSBFA representative before submitting the application to discuss eligibility of the proposed financing. 3. The Bank should submit to VSBFA at the address below the original Borrower s Loan Application and the Bank's Application for Guaranty, and. the Bank s credit memo and financial analysis; three years of historical financial statements and an interim statement (within 90 days) certified by an officer of the company or the owner. If the financials are compiled, it is recommended that they be supported by tax returns. spreadsheets (including financial ratios) of the company s financial statements, if prepared by the Bank. personal financial statements and credit reports for all principals and tax returns, including all schedules. one original copy for all other supporting documents; copy of bank s commitment letter. If not available, a copy of bank s approved internal term sheet; $200 application fee. GUARANTY FEE: For approved and closed loans/lines, an upfront guaranty fee of 1.5% of the guaranteed portion of the loan or line must be remitted to VSBFA by the Bank at the time of loan closing. The Bank may require that the application fee and the guaranty fees be paid by the borrower. Note: For guaranties closed between December 1, 2011 & December 1, 2012, the VSBFA will waive the guaranty fee. 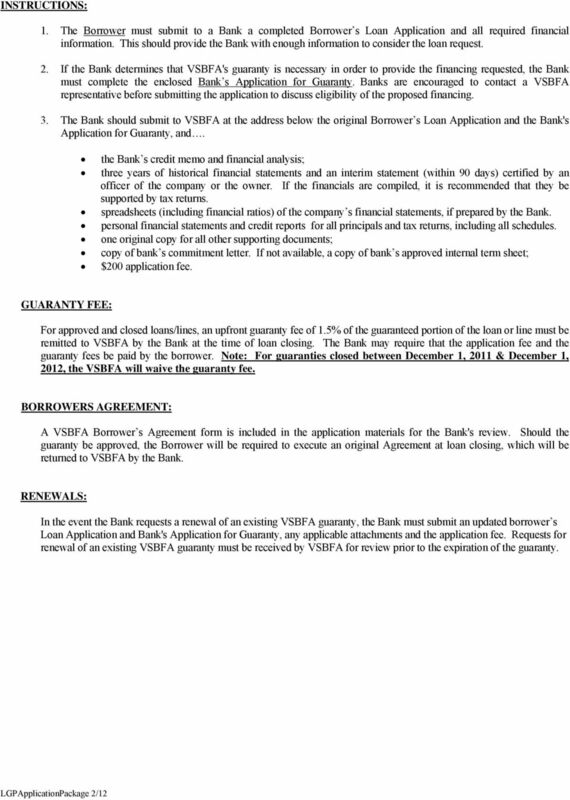 BORROWERS AGREEMENT: A VSBFA Borrower s Agreement form is included in the application materials for the Bank's review. Should the guaranty be approved, the Borrower will be required to execute an original Agreement at loan closing, which will be returned to VSBFA by the Bank. RENEWALS: In the event the Bank requests a renewal of an existing VSBFA guaranty, the Bank must submit an updated borrower s Loan Application and Bank's Application for Guaranty, any applicable attachments and the application fee. Requests for renewal of an existing VSBFA guaranty must be received by VSBFA for review prior to the expiration of the guaranty. 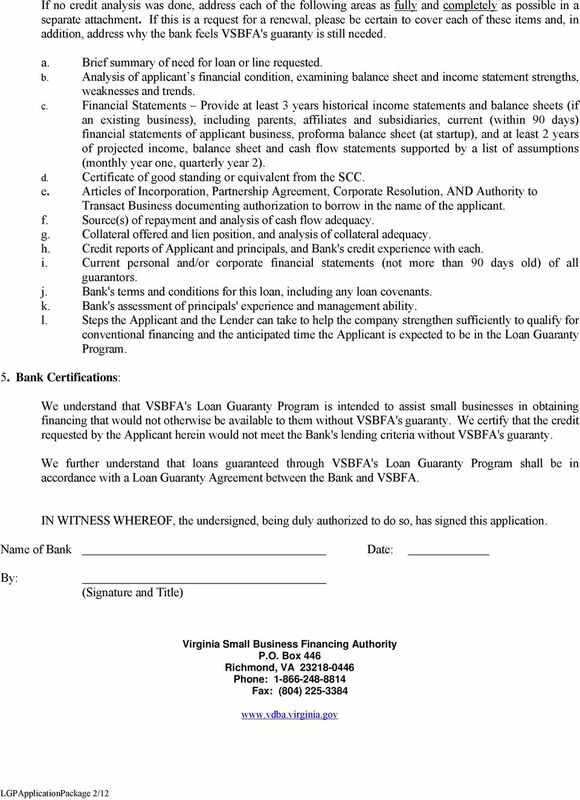 6 Virginia Small Business Financing Authority Loan Guaranty Program Bank s Application for Guaranty Note: Bank should review the applicant s VSBFA Application for Financing Assistance before submitting it to VSBFA to be sure it is complete and that it accurately describes the loan request and collateral offered. Since economic impact is an important criterion for VSBFA approval, the application should also include information regarding potential job creation. 1. Name of Account Officer: Title: Name of Bank: Mailing Address: Telephone # Fax # address 2. Name of Applicant Company: 3. Guaranty Request Summary There is no maximum loan amount; however, the maximum aggregate guaranty available is $750,000 or 85% of the loan amount, which ever is less. Check one: Original request for guaranty OR Request for renewal If this is a request for a renewal, when does the bank's present commitment from VSBFA expire? Note: Requests for renewal of an existing VSBFA guaranty must be received by VSBFA for review prior to the expiration of the guaranty. VSBFA prefers to limit subsequent line renewals to six annual renewals so that the maximum period of guaranty does not exceed seven years. Please specify: Line of Credit Amount $ Requested VSBFA Guaranty Expiration Date of Line of Credit (maximum 1 year commitment, up to 6 renewals allowed.) Interest Rate: % (fixed) or Prime + (variable) Term Loan Amount $ Requested VSBFA Guaranty Loan Term months (maximum guaranty term is 84 months) Note: If loan will not be fully amortized in equal monthly installments over the term of the guaranty, please indicate specific terms (e.g., interest only for 6 months or 10-year payback with 7-year balloon, etc. ): 4. 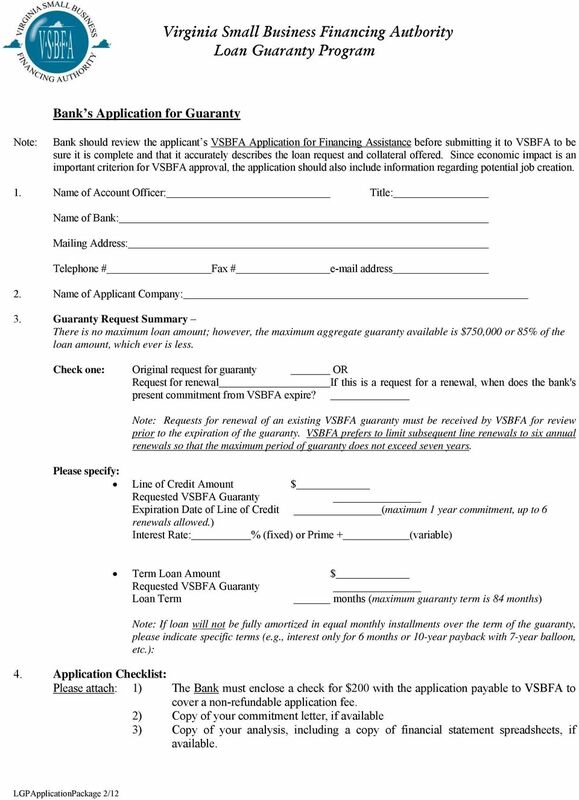 Application Checklist: Please attach: 1) The Bank must enclose a check for $200 with the application payable to VSBFA to cover a non-refundable application fee. 2) Copy of your commitment letter, if available 3) Copy of your analysis, including a copy of financial statement spreadsheets, if available. Performance and Payment Bonds Submission Requirements 1) Request for Performance and Payment Bonds. (Forms attached for your convenience, please return only with a Performance and or Payment Bond Request.